The Easter holidays on theKvarner islands are always a special experience, and the island of Rab is a particularly good choice for this occasion. Humble prayers, processions, Easter wishes, presents, and songs that celebrate Easter are all part of the island’s tradition. Egg dyeing, Easter egg hunts, dishes and cakes, and the blessing of food and eggs in an Easter basket are only a few of the customs that you will have an opportunity to experience on Rab – the Island of Happiness. The warmth of the spring sun awakens life on the island, which can be seen on the Easter table. Savoury island lamb with green onions, asparagus prepared in a variety of ways, and numerous other specialities are best after a long walk in spectacular nature. Join in the traditional customs of celebrating Easter, or simply enjoy your spring holidays in good company and savour the traditional dishes of the island’s cuisine. 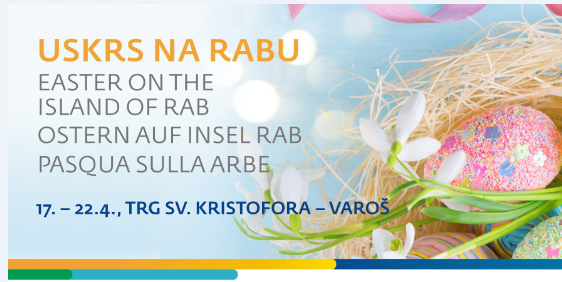 -11:00 Rab Easter breakfast on St. Christopher Square in collaboration with Imperial Riviera company – Easter specialities for local people and guests – boiled ham, Easter eggs, homemade bread, sweet bread, and an entertainment programme.